Profile: The chilling rumble of Dirge's engines as they approach from a distance is merely a prelude to the petrifying fear they induce in whomever is unlucky enough to hear as they pass overhead. And fear is something with which Dirge is quite familiar. He knows its all-consuming power; he understands how it can defeat even the mightiest of armies. He handles it with the same exacting proficiency that a concert pianist handles his piano's keys. Even his fellow Decepticons are put off a bit by his mournful, silent manner. Ramjet sums up everyone's feelings: "He gives me the creeps." 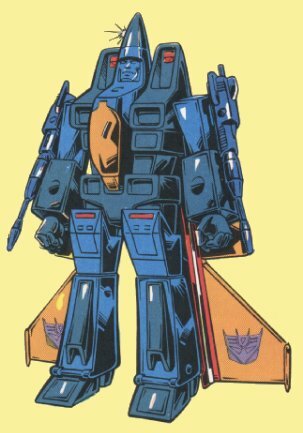 Abilities: In jet mode, the sound from Dirge's engines has the uncanny effect of producing spine-tingling (circuit-tingling, in the cases of other robots) fear in nearly everyone who hears it. Apparently, the engines emit a combination of frequencies that has a disorienting, fear-provoking effect on the nervous systems of all those within earshot. He also carries two air-to-air missiles and two automatic machine guns. Weaknesses: In order to perform well as a warrior, Dirge needs to feel that he's in control of a situation. When things get out of hand, Dirge is prone to suffer from the very weapon he himself wields so effectively - fear. Dirge's usefulness evaporates under these conditions.